I had to put a few things on hold while work was busy in the last month, and a number of little projects or quilt blocks were started and finished without mention, so I thought I’d share them here. I made this zippy pouch for my little sister for her birthday. She wanted something she could put her kindle in when traveling, and I knew this was the perfect time to bust out the typewriter fabric. I picked these typewriter prints up from Brenda when she had them in her shop for about 2.5 seconds a couple of months ago. I absolutely love them! 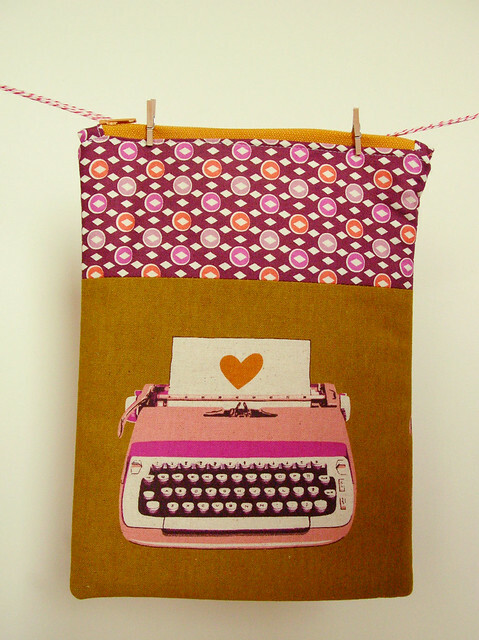 Plus, I think they work wonderfully with my Hope Valley fabric. I may be a little obsessed with this line, and stocked up now that it’s out of print. 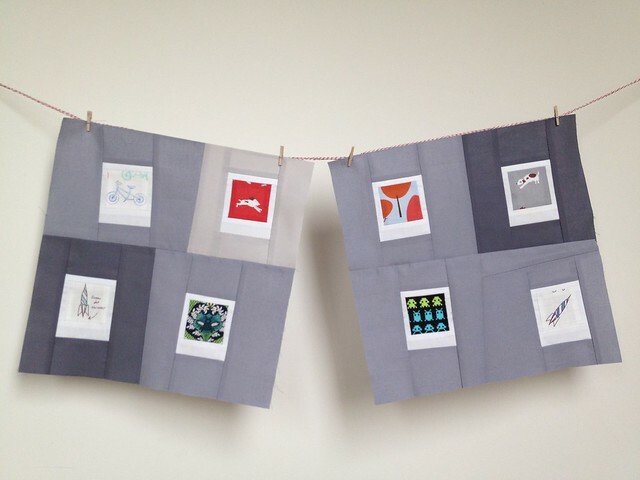 Last month I made the polaroid bee blocks for Rachel. Aren’t they adorable? I love how she put them all together into the “tossed polaroids” quilt! 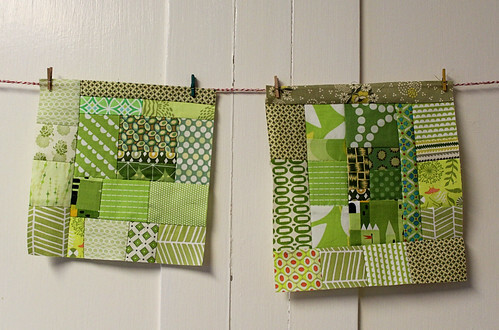 Next I made these scrappy blocks for Deb. 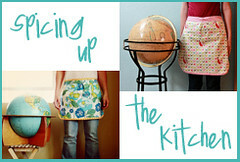 She linked to this tutorial from Don’t Call Me Betsy. 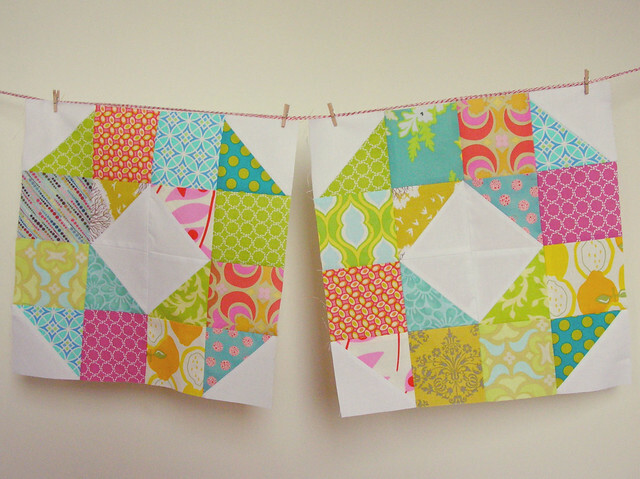 This was the first time I had worked with half square triangles, and I can see why people get hooked on making these! 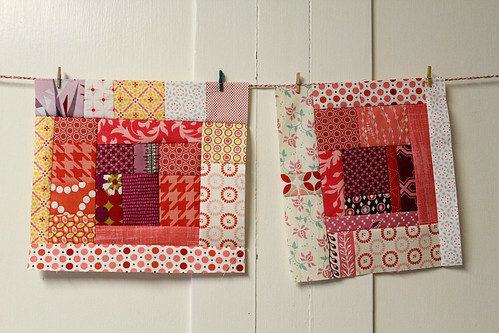 I would love to make a quilt out of these blocks in the future. 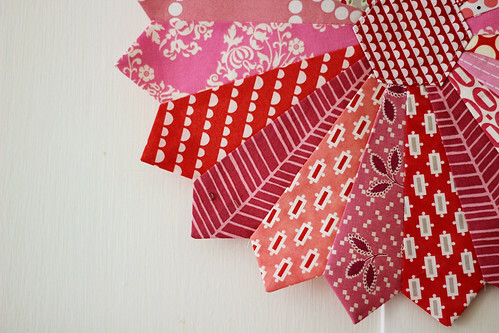 I’m not sure when I’ll have time, but I *may* have stocked up on some neutral gray fabrics from Pink Castle recently with the hopes of using them in this quilt! 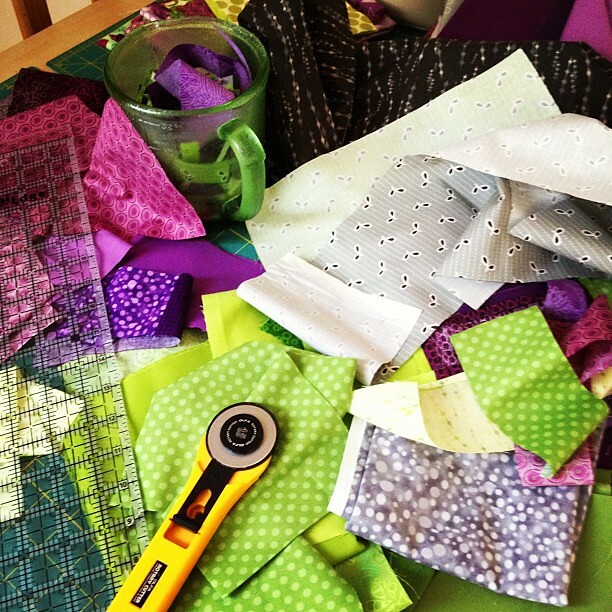 And, I cut into a lovely pile of fabric for a new quilt that I’ll share here soon. I know I say this frequently, but I think it’s my new favorite! 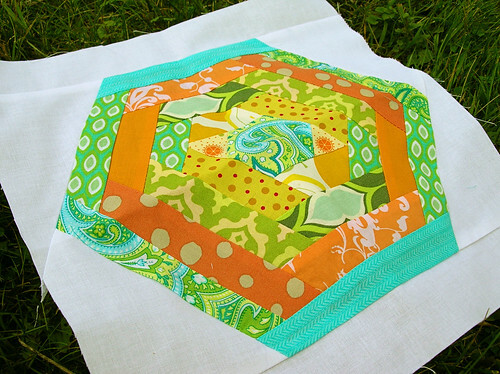 I’m linking up to Ellison Lane Quilts for the Summer Sew-Along! Check it out to see lots of other great projects. 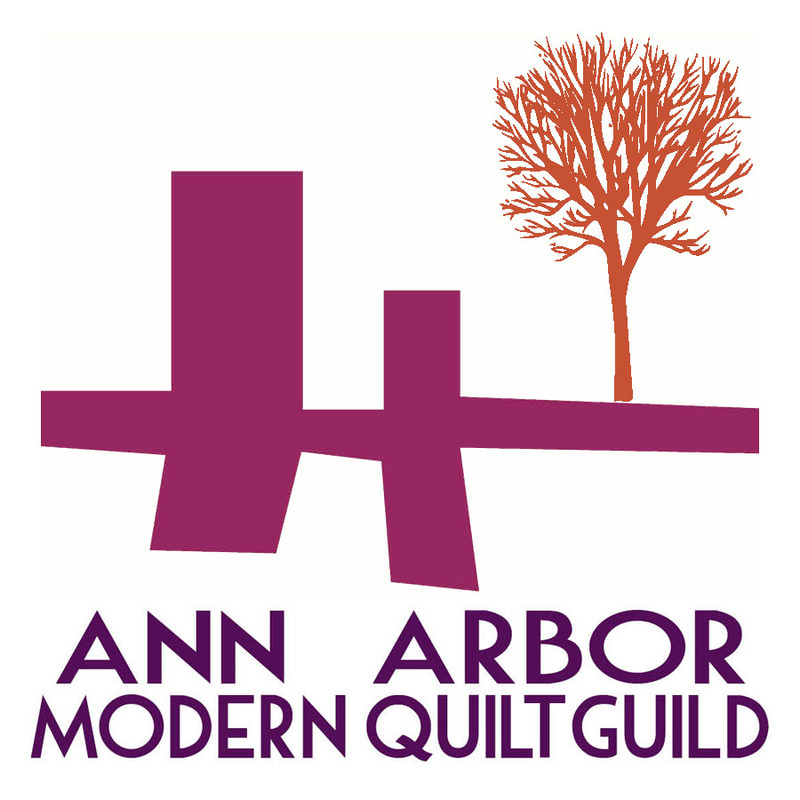 And then, to follow it up, I decided to work on the blocks I needed to make for the Ann Arbor Modern Quilt Guild. 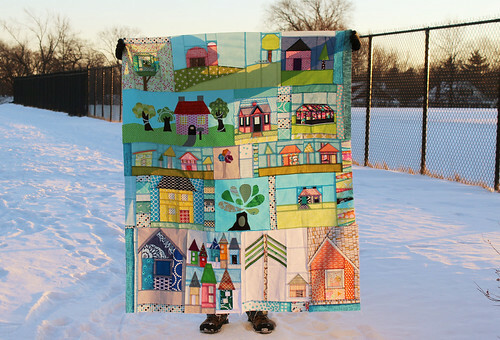 We received some of Jay McCarroll’s Habitat fabric, and we decided that everyone would make as many 12.5 inch square blocks as we can to put together into some quilts for charity. We could use any style we wanted for the blocks, and I decided to stick with the improv style. 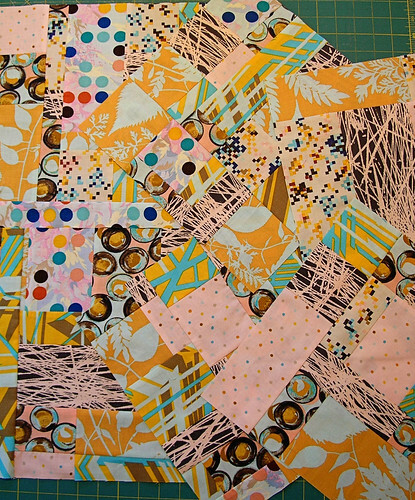 I felt it went really well with the colors and patterns of the fabric. I was able to get quite a few blocks out of my stack of fabric! 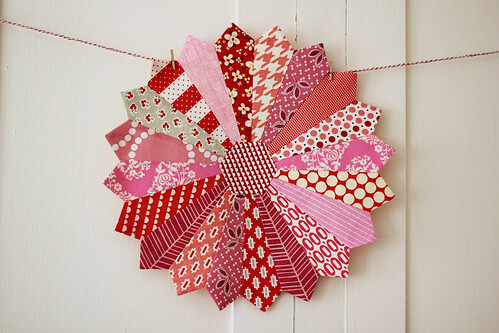 This month Lee wrote a great tutorial for our Do. 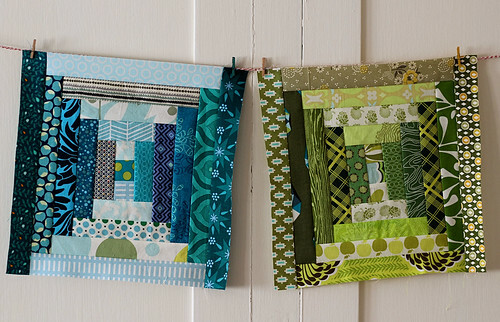 Good Stitches quilting bee blocks. She instructed us to make log-cabin style hexagon shaped blocks in greens, blues, oranges, and yellows. 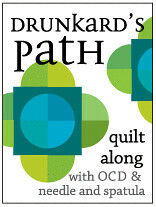 It was really fun to work with this gorgeous palate, even though I struggled with “squaring up” (“hexagoning up”??) my blocks. 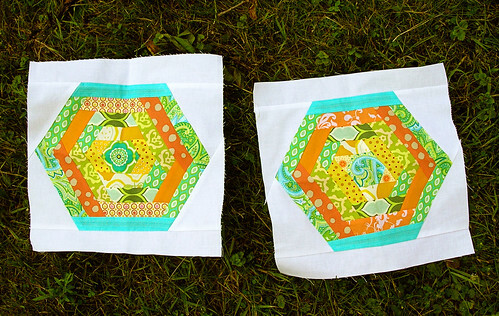 I think the hexagons themselves ended up a little smaller than in her post, but I made sure that with my white framing fabric, my squares reached the 12.5 inch requirement so they’ll fit into the quilt. Thanks, Lee, for such a cool tutorial and block this month! I’m putting them in the mail tomorrow! 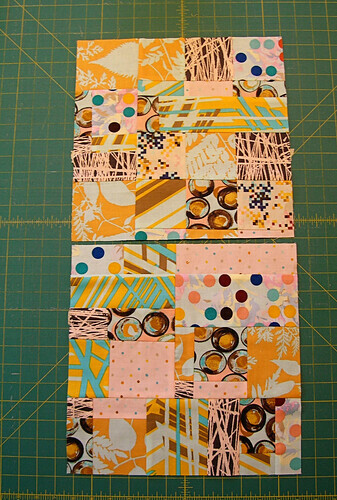 These are my first bee blocks for the Do. 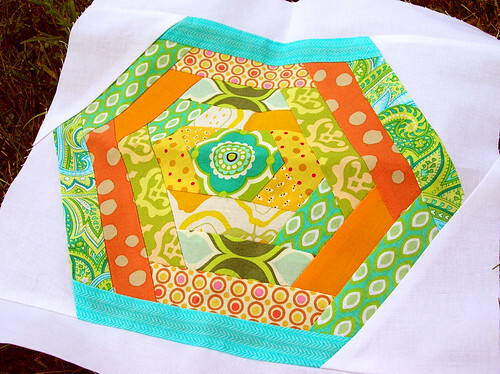 Good Stitches quilting bee for March. 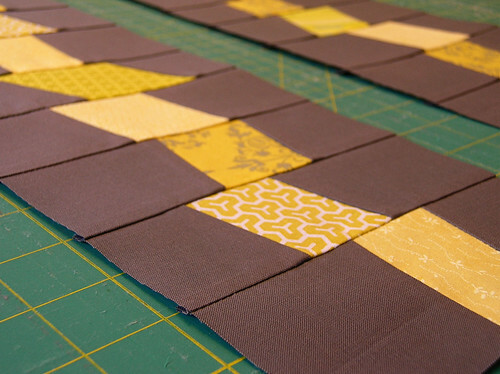 I was so excited to be asked by Rachel to join this virtual quilting bee, and I got right to work on this month’s blocks, which were very fun to make. 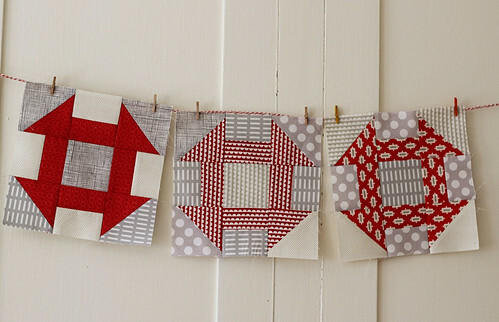 In fact, I totally want to make a quilt using blocks like these! I think that may be the only downside to a bee like this– I will want one of everything for myself! 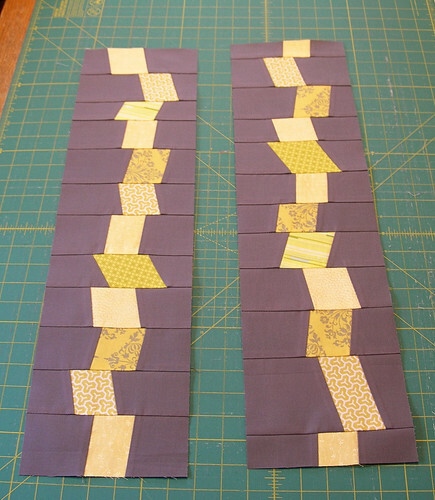 I sent the blocks off to the quilter this month, who will put the quilt together once all the blocks arrive. 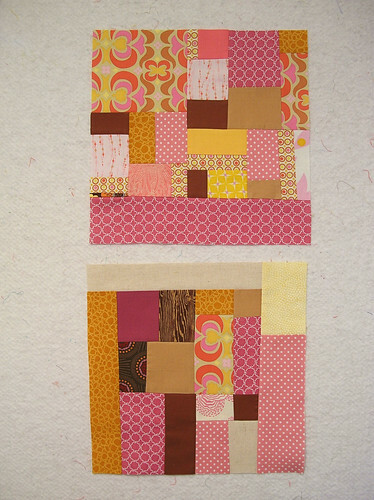 (If you’re interested, you can see some photos of blocks and quilts in progress at the Do. 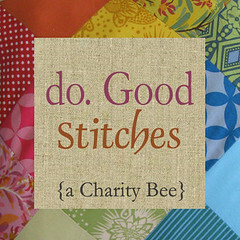 Good Stitches flickr group). 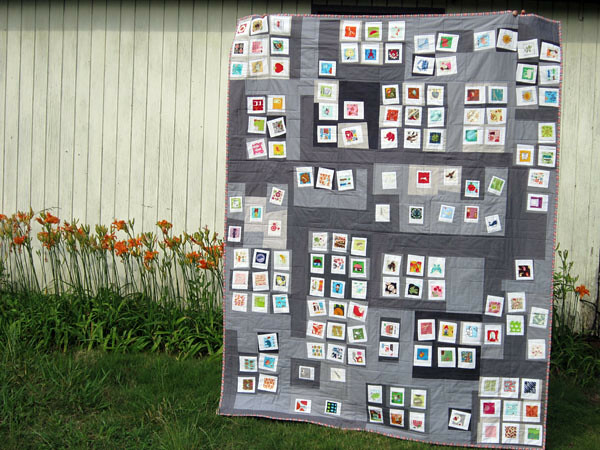 All of the quilts are sent off to various charity and non-profit organizations once they’re finished, and I’m really happy to be a part of such a good group! 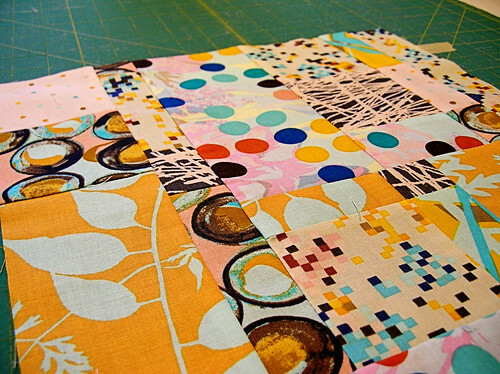 Plus– next month I get to design the quilt, and I already have a million ideas about what to do… I’ll be making some test blocks for it this weekend!